HBO‘s Cube installation and interactive site, launched in 2009, has won Gold at the Art Directors Club awards, following on from the Pencil award for entertainment at the One Show. The integrated campaign is centred on a four sided screen, presenting a multi-dimensional storytelling experience both online at HBOimagine.com and in select installations in New York City and Philadelphia. HBO Cube offers four different perspectives on the same scene, simultaneously. Two short films, Heist and Affair, were told from four distinct points of view. Each side of the cube stands alone as an engaging film, and as one piece of a larger puzzle. As viewers move around the cube, they watch the story unfold from different perspectives, forming different perceptions, and often misperceptions, of the characters and plot. Only by watching the story unfold from multiple sides of the cube can we begin to see the bigger picture. 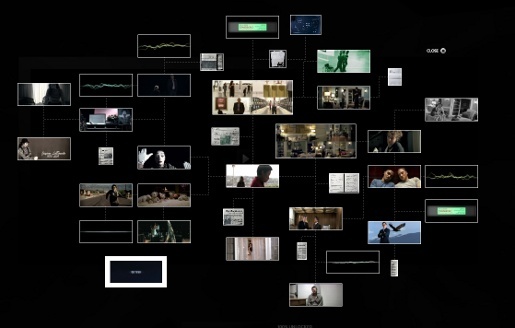 The campaign feeds into an user-generated film site, hboyourimagination.com, with three further films, Trapped, The Big One and Happy Kid encouraging the submission of new work. “The Affair” presents a drama featuring a husband, wife, maid, and a mysterious half-naked ma. “Heist” shows the execution of a meticulously organized crime in an art gallery. The cubes are connected by an additional 41 pieces of content that include both short- and long- form video, news stories, images, and audio files. As you navigate the content, a status bar tracks your progress and once every piece of content is unlocked, you are taken to a new page that contains a final video that connects the pieces together in a more traditional, linear fashion. The Imagination campaign was developed at BBDO New York, and The Barbarian Group by chief creative officers David Lubars and Bill Bruce, executive creative directors Greg Hahn and Mike Smith, assistant creative director/copywriter Adam Reeves, assistant creative director/art director Brandon Mugar, director of integrated production Brian DiLorenzo, content producer Nicholas Gaul. Filming was shot by director http://theinspirationroom.com/daily/tag/noam-murro via Biscuit Filmworks with executive producer Shawn Lacy and producer Jay Neal. Visual effects were produced at Animal Logic by VFX supervisor Nicholas Ponzoni, VFX producer Nerissa Kavanagh, Flame artist Verdi Sevenhuysen, VFX producer RObert Evans, editor David Henegar. Telecine was produced at The Syndicate by Marshall Plante. Audio was mixed at POP Sound by Mitch Dorf, and Sound Lounge by Cory Melious. Music is by Search Party Music. VFX Supervisor Nick Ponzoni explains “ For ‘Heist’ the key challenge was to match the action and timing for each of the four panels since each side of the cube was shot separately. To finesse the final images, some of the characters and actions were digitally removed, replaced and re-timed to create the final seamless effect.